Graduate research candidates are the powerhouse of research in universities, yet many have reported feelings of isolation, burnout, and career uncertainty. Karen Barry reports on a study of Australian research candidates which found that increasing numbers are suffering from heightened levels of depression, anxiety, and stress, often citing reasons related to academia’s general work processes, such as writing or publishing research or maintaining motivation while working alone on a single topic. Higher education institutions can and must do more to increase monitoring of mental health and offer graduate researchers the support they require. Whose responsibility is it to monitor the mental health of graduate research students? If it is academic institutions, then no wonder it has taken so long to be thoroughly understood and addressed. As in many other highly skilled professions, mental health has long been taboo and over-work the norm. Graduate research candidates are the powerhouse of research in universities worldwide, contributing to two-thirds of academic output. However, online forums are swelling with reports of isolation, burnout, and career uncertainty. Studies backing these accounts with evidence related to mental health levels are growing and can no longer be ignored. In the last 12 months, a global online survey found that graduate research candidates were six times more likely to suffer anxiety and depression than the normal population and a Belgian study suggested 32% are at risk of having or developing a common psychiatric disorder. Earlier this year we published findings from a study of Australian research candidates that mirror that which has been found elsewhere – i.e. that levels of psychological distress are higher than normal in research candidates. Our study found that mean scores for perceived stress, depression, anxiety, and stress were higher among this group than a normal population of similar age. Figure 1: Comparison of psychological distress indicators between an Australian PhD group and an age-matched normative population. DASS is the Depression, Anxiety and Stress Scale. Data sourced from “Psychological health of doctoral candidates, study-related challenges and perceived performance”, published in Higher Education Research & Development (2018). Word cloud image sourced from “This is your mind on grad school”, Berkeley Science Review (concept for image, Holly Williams; design, tagxedo.com). Whose responsibility is it to support the mental health of research candidates? The supervisor? The academic unit? The academic institution? The community? And when is the support needed? When comparing candidates at different stages of their degree programme in our study, no significant differences between levels of psychological distress were found. However, we did find slightly raised levels in the second year. This matches with the concept of the “second year blues”, but is that just an easy platitude? We found a bigger impact on mental health related to self-reported progress. Those who reported either being behind or ahead of schedule reported significantly higher stress levels than those who reported meeting their scheduled milestones. Both of these states could indicate additional support is needed. Research candidates are some of our best and brightest. So why are they experiencing higher levels of stress than normal? In our study, we asked about the biggest challenges they faced related to their PhD studies, and many mentioned topics we categorised as “general work processes”. 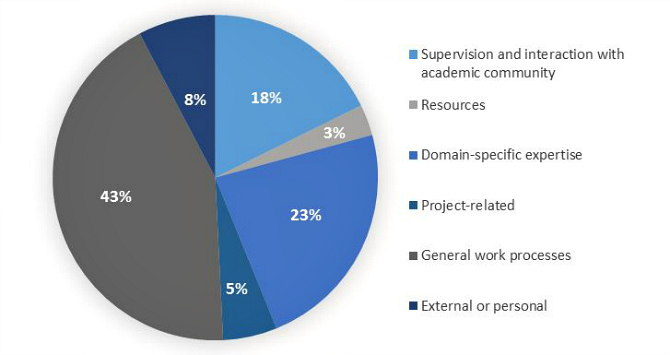 Figure 2: Percentage of PhD candidates in an Australian study who reported challenges related to their PhD studies, within six category types. Data sourced from “Psychological health of doctoral candidates, study-related challenges and perceived performance”, published in Higher Education Research & Development (2018). Within the general work processes theme, 17 candidates referred specifically to challenges of writing or publishing research, while 29 reported challenges related to managing themselves, including motivation. Maintaining motivation over 4-5 year periods can be challenging, especially when working alone on a single topic in which you are expected to become “the expert”. While our study looked specifically at factors related to the PhD itself, other broader factors can have a big impact on psychological distress (or conversely, poor wellbeing). A 2014 University of California study found that career prospects, overall health, and living conditions were the top three predictors of wellbeing for PhD students. Graduate numbers have increased steadily in recent decades; in 2014 counts were over 67,000 in the USA, 24,000 in the UK, 19,000 in Japan, and 8,000 in Australia. What may seem like an elite minority is fast becoming a considerable number, on whom society will rely for future research and innovation. So how do academic institutions and communities change to offer the support needed, or improve what they already do? A recent report provides welcome guidance. Published by Vitae (the “global leader in supporting the professional development of researchers”) and funded by Research England, it puts forward ten recommendations for consideration by the newly formed UK Research and Innovation and higher education institutions. These include strategies which increase monitoring of mental health and the required support (e.g. training in mental health for supervisors). Countries around the world, including Australia, will be taking heed of this advice. For me, this topic is deeply personal. As an academic, supervisor, graduate research coordinator, and previously Deputy Associate Dean (Research), I have seen the challenges daily. However, I’ve also seen the triumphs of research training, including overcoming both intellectual and psychological challenges. Sometimes, things have to get worse before they get better. It is high time for academic mental health to get better and for the triumphs to outnumber the burnouts. This blog post is based on the author’s co-written article, “Psychological health of doctoral candidates, study-related challenges and perceived performance”, published in Higher Education Research & Development (DOI: 10.1080/07294360.2018.1425979). Featured image credit: Alex Ivashenko, via Unsplash (licensed under a CC0 1.0 license). Karen Barry is a Senior Lecturer and Researcher at the Tasmanian Institute of Agriculture, University of Tasmania. She has 20 years research experience in plant health for agriculture and forestry, as well as substantial lecturing and PhD supervision experience. In recent years a large part of her focus has been on graduate research management and skills development, including within her capacity as a Deputy Associate Dean (Research). Through collaboration with workplace psychologists and mental health experts, she has initiated studies into wellbeing in PhD candidates, and is passionate about supporting the PhD journey in all aspects. Her ORCID iD is 0000-0003-2297-7931.